Cage crinolines/hoop skirts/skeleton skirts/man, whatever you want to call them require more effort and/or expense than, say, pocket hoops. 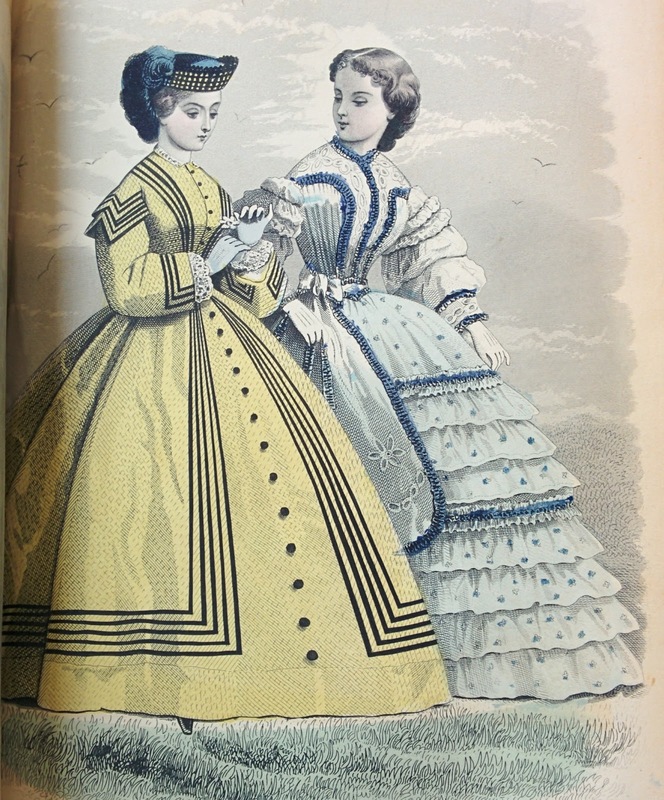 Or nothing, for periods that only involve layers of petticoats and not an actual support structure. But I'm not just looking to make an outfit to fulfill a long-held wish for a froofy skirt. Something I don't talk about very much here is that I struggle with feelings of incompetence when it comes to my sewing. My first attempt, sometimes first two attempts, at a particular style or era usually results in disaster. For one thing, I prefer to work from scaled patterns, and I generally make the bodice too big - realizing this at the last second and taking it in haphazardly from the center back as a make-do. I've pinned the 1840 bodice to the right size and am going to fix it properly soon, but I'd really like to start afresh. With the older fitted bodice (as well as my early bustle gown from last summer) as practice and a guide, I think I can make something that I'll be proud of, that I'll look at pictures of myself in later and think, "I had a great time that day," instead of, "This is painful, was everyone wincing when they caught sight of me?" A big part of that is hair/headwear. About a month ago I chopped off most of my hair (it looks very cute), so it's imperative that I come up with something to cover it, but this area is even weaker for me than fitting. Hairdressers tell me I have great hair, not to brag, but it hates curling irons (it ends up less curly than it started) and pins slide out even though it's kind of frizzy. With it short, I'm just concentrating on the bonnet. The last time I made a bonnet, I used a pattern from a book, scaled it up to fit my head, and adjusted it to have the flare I wanted. I was proud of it at first, but later realized that it leaned to one side and was kind of awkward. And that was for a fairly standard shape! 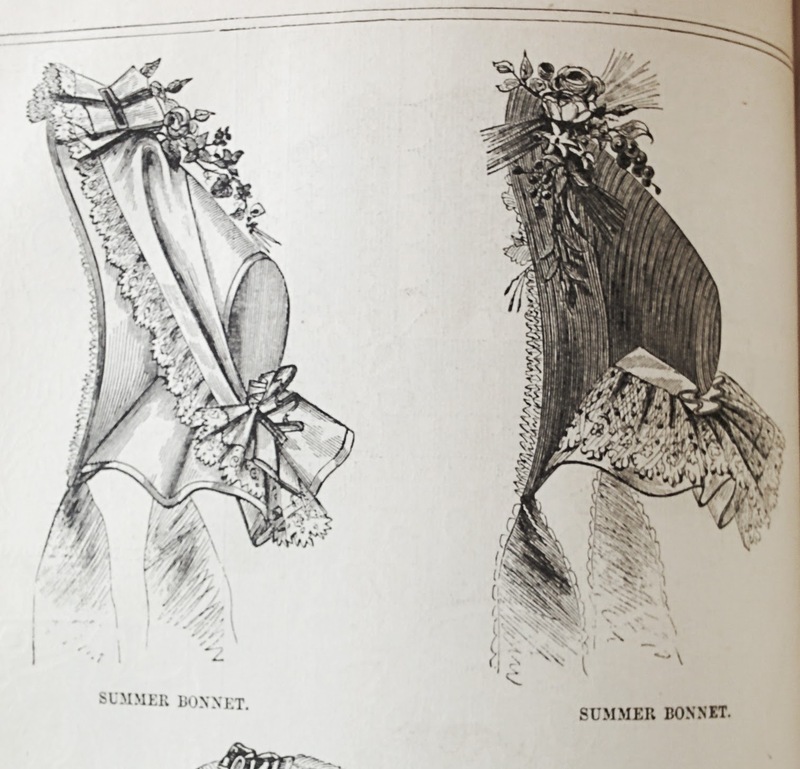 The 1850s-60s spoon bonnet shape is very odd to me, and I was prepared to buy an actual buckram or straw frame ... but then I looked into them, and oof. A bit steep, especially since I'm going to buy a pre-made hoop to cut down on stress and post-event "I look so awkward" blues. So I shopped around and ended up buying a pattern for it (along with three others - a high-crowned Regency bonnet, an 1870s-80s hat, and one of those odd tiny 1890s bonnets that sit on your bun) from Lynn McMasters, at a price - $10 each - that seems to be very fair for the market. 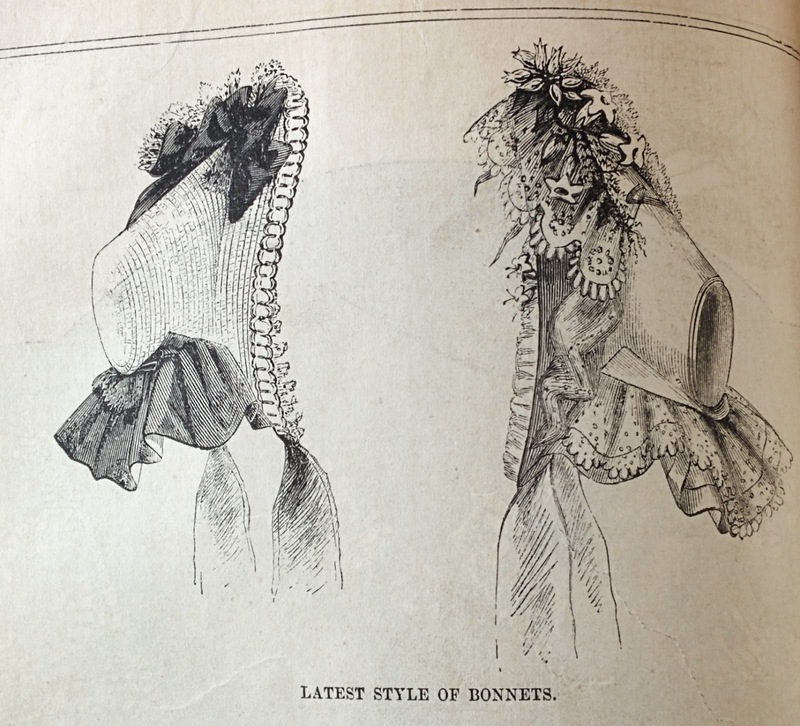 I'm going to make sure not to leave this until last, and so I'm looking at bonnet styles at the same time as dress trimmings. I'm also going to run a quick eye over the bonnets at the Chapman. They might be all straw, but they might give me a good idea for trimming. But from these, I'm thinking of a muslin ruffle around the brim and a self-fabric bow or two on top. So, anyway, the dress. You've probably noticed my preference for my own patterns, but in this case there's the added feature that, while the original's silk, it's very plain and simple. Because I'm not sure I'm up to silk-level yet, I've bought a quantity of cotton check, and that means I need to make sure the pattern is correspondingly simple. There isn't going to be a big triple-box-pleated flat ruffle as there is on the original, or complex soutache or ribbon braiding. This dress has a simple fitted bodice, buttoning (and hooking) up the front, with plain two-piece sleeves, and a pleated and gored skirt. 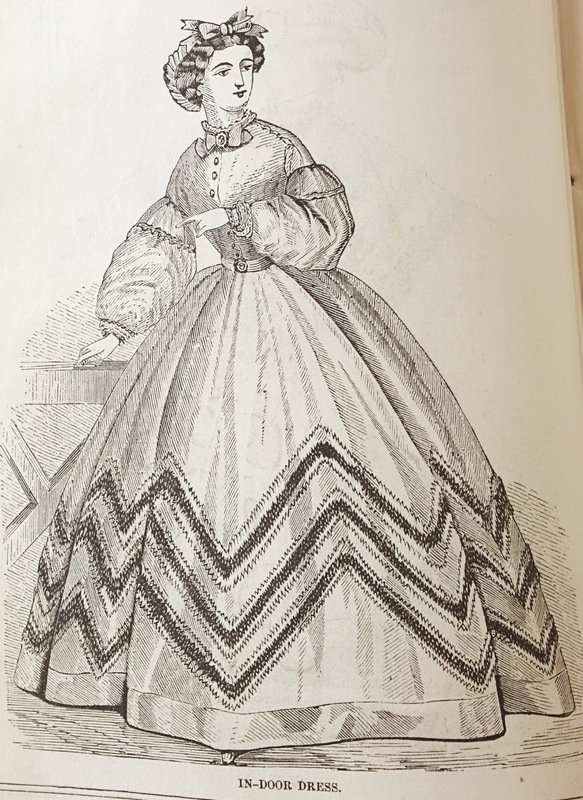 Originally I put the dress at about 1865, but after comparing the difference between the front and back lengths of the skirt to other patterns, and looking through the 1862 Peterson's some more, I'm pretty sure it's from 1862-1864, stretching into 1865 or '66 if the woman didn't get an elliptical hoop. I really like the Eugenie, below. The description says that it's pearl-colored silk, trimmed with narrow black lace, worn with a "Medici ceinture". On the left is a morning dress for the country in buff piqué. On the right are a buff piqué/Marseilles outdoor dress, and a grenadine house/morning dress. Some more interesting, bold trim. The ruffles are definitely out and the right buff dress is a little too high-fashion for me, but I liked the picture and wanted to share it. I like the Eugenie a lot (and could definitely see dressing my dress up with a Medici belt or Swiss waist at some point), but of course it's evident that it's a silk gown. (Because I just said it.) 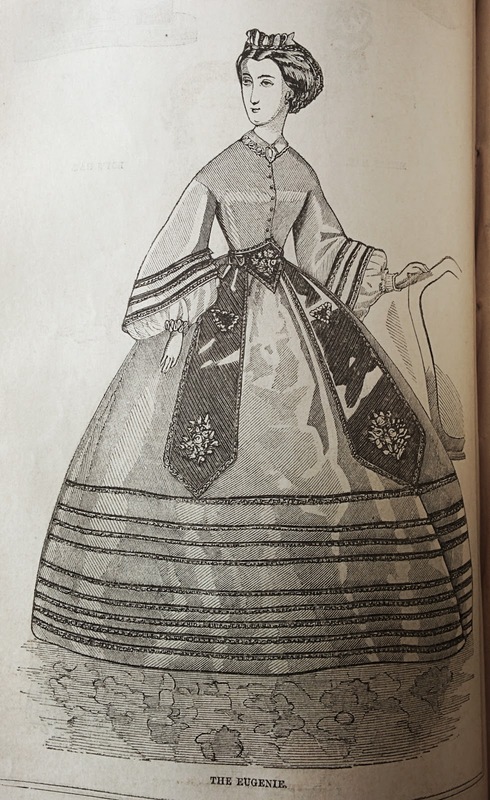 It struck me while I was looking around at my Pinterest board that the bodices of cotton dresses are most commonly gathered to the waistband and the sleeves to cuffs. So here's the problem: part of the point of the dress is to get me better at fitting and more used to general silk dress forms so that I can later make one, but at the same time, I put a very high premium on accuracy. I could go through the back and forth of my thoughts and my honestly rather paranoid issues regarding my need to be Perfectly Accurate At All Times, but it would be rambly and boring. So it must suffice to say that I'm coming down on the former side - using it as practice. I mean, I'm not going to go with the Eugenie's pagoda sleeves even though they're terribly cute, because that's very wrong unless you're making a house-dress as far as I can see. My feeling is that 1) okay, it's not totally wrong, it's possible even if it's over-represented among reenactors, and 2) this upcoming event I'll be wearing it to is most likely not going to be a progressive or high-accuracy one, and anyplace else I wear it will just be a gathering of friends. So I will use cotton and proceed not to feel bad about it. And maybe next year I'll get ambitious and confident and make a proper Eugenie from pearl-colored silk with black lace. With a Medici ceinture. May I recommend www.thesewingacademy.org? The forum is moderated and contributed to by some of the foremost people in mid-nineteenth century research and is a great source of information. You can ask questions, as well as look at original images and other people's work. If you are interested in accuracy, even as you are started out, this is the place to start! Thank you! I've checked out the site before, and I think I registered but never got the confirmation email. It seems like a great resource.